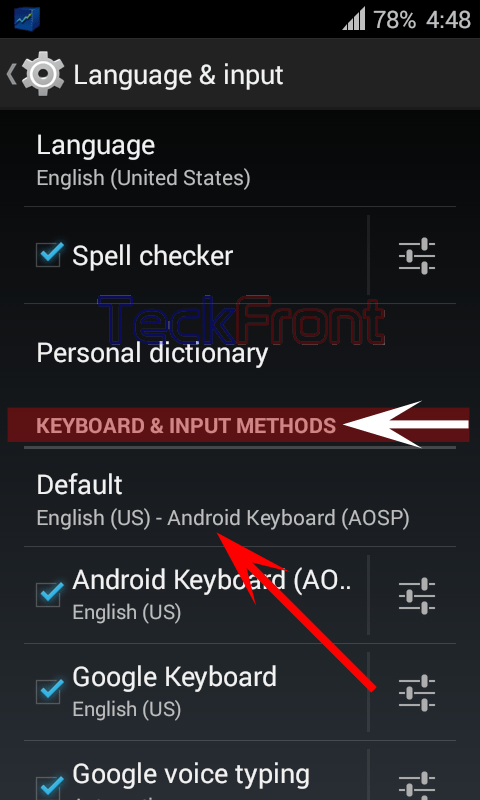 How to Choose Input Method (Keyboard) in Android 4.4.4 KitKat Device? Data input mechanism plays an important role in increasing productivity and efficiency of the mobile devices. Understanding the need for the productivity, Android 4.4.4 KitKat has included two separate but equally useful and powerful systems of inputting data. One input method is Android Keyboard while the other is Google Keyboard. As both the keyboards are developed by just one company but for different users, both have different approach and different purposes. Their usage depends upon the user’s choice, requirements or need of the jobs. You may select any of the two keyboard in your Android 4.4.4 KitKat device but remember that Android Keyboard is set by default while on the other hand, you need to download and install Google Keyboard app from the Google Play Store. Some of the Nexus devices may have the Google Keyboard as built in app while in other devices, you need to download and install Google Keyboard app. When you have downloaded and/or installed Google Keyboard app, it is time to make it a default app. For the purpose, follow the instructions. Command Line: Settings – Home > Language & input – PERSONAL > KEYBOARD INPUT METHODS – Default. 1: Follow the Command Line to open up the ‘Language & input’ screen. 2: See the status of ‘Default’ – KEYBOARD & INPUT METHOD is English (US) – Android Keyboard (AOSP). 3: To change the Default keyboard, tap it. It will open up a prompt; ‘Choose input method’. 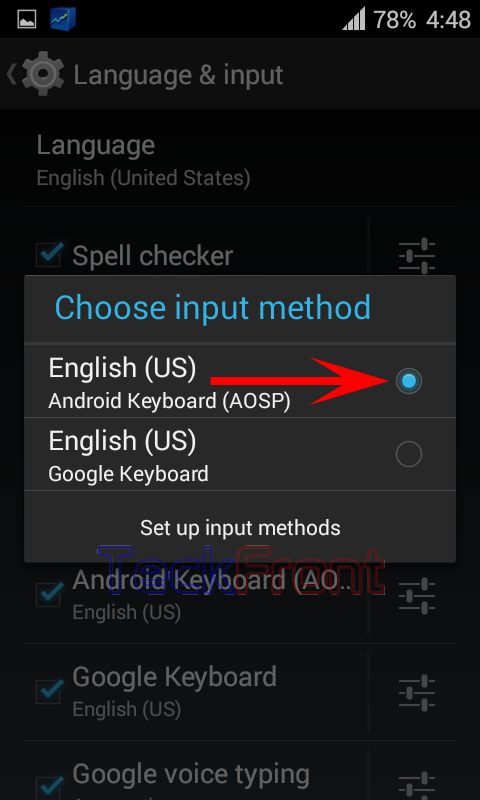 There are 2 options, English (US) Android Keyboard (AOSP) and English (US) Google Keyboard, are available while the English (US) Android Keyboard (AOSP) is set by default. 4: If you want to change the keyboard, tap the ‘English (US) Google Keyboard’. It will take you back to ‘Language & input’ screen. 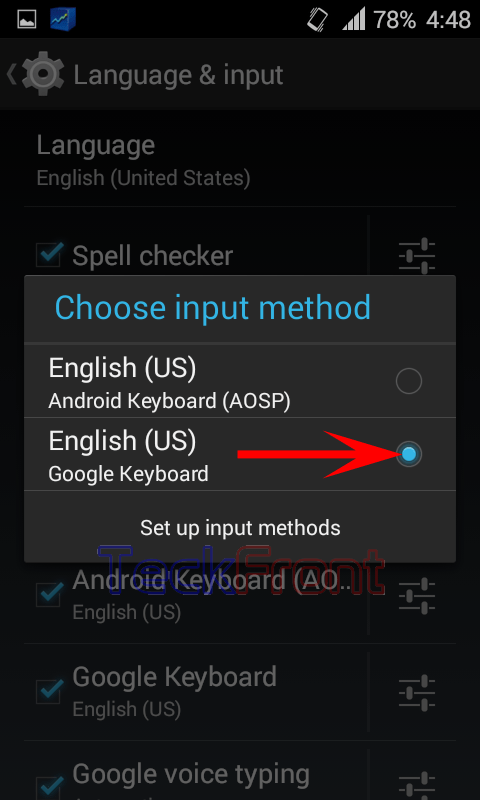 5: See the status of the KEYBOARD & INPUT METHOD is changed to ‘English (US) Google Keyboard’. 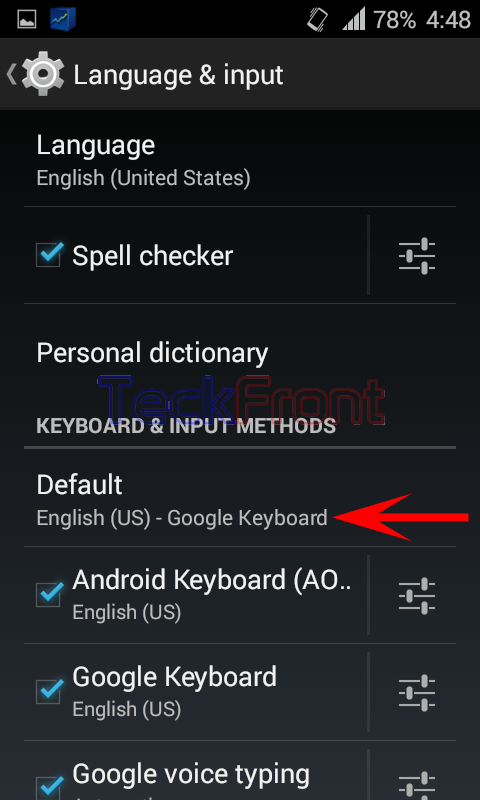 Older How to Choose Android or Google Spell Checker in Android 4.4.4 KitKat Device?